Lactofermentation is the process by which lactic acid forming bacteria metabolize the sugars in foods and convert them to lactic acid. These bacterial strains were first isolated in milk, hence their name, yet while many of the bacterial strains are found in milk and in cultured dairy products, lactobacillus aren’t exclusively found in milk; rather, this type of bacteria is present nearly everywhere. Lactofermentation or lactic acid fermentation, in contrast to ethanol fermentation in which alcohol is created, is the fermentation process used in making a wide variety of foods including fermented vegetable dishes like sauerkraut and beet kvass as well as cultured dairy products like yogurt and kefir. It’s these bacteria that are responsible for gobbling up the carbohydrates naturally present in a cucumber and turning them into sour pickles. Many newcomers to fermentation mistakenly believe that, in order to make lactofermented foods like sauerkraut, they must add a dairy product such as whey to kickstart the fermentation process. This myth was popularized in Nourishing Traditions, a deeply influential book on traditional foods, in which all fermented vegetable recipes included the use of whey. Since the bacteria responsible for lactic acid fermentation exist on your skin, on your food, on your countertops, it is unnecessary to inoculate your foods with a starter culture. They will ferment without a starter, such as whey, and will do so successfully, safely and often with better tasting results. Almost all fermented vegetable recipes, including homemade sauerkraut and sour pickles, don’t need or derive much benefit from the addition of a starter culture, and most are traditionally prepared without a starter culture. Instead of adding a starter to your fermented foods, you simply salt them, pack them into fermentation crocks or jars with an airlocked lid, and allow their native bacteria the time to do their work, turning those fresh vegetables marvelously sour and preserving them for longterm storage. This process of fermenting vegetables the traditional way, in absence of a starter culture like whey, is also known as wild fermentation a term that was popularized by Sandor Katz in his book of the same name. That is, you’re using wild strains of bacteria rather than the “domesticated” strains of bacteria in a starter culture to ferment and preserve your foods. 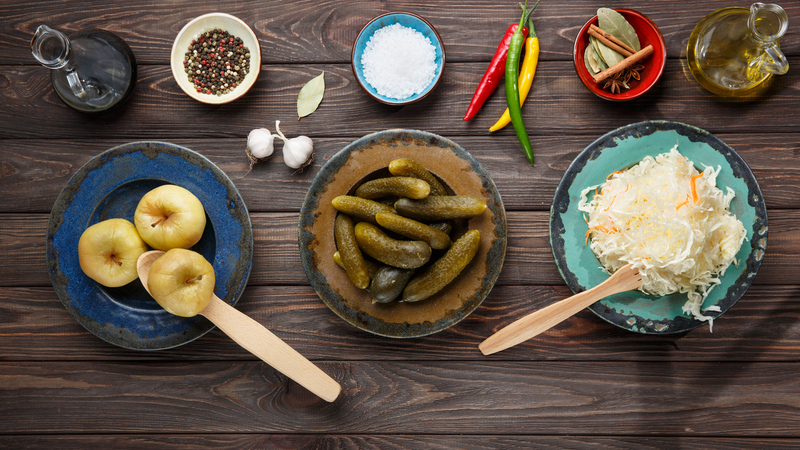 All fermented vegetable dishes including sauerkraut, sour pickles, sauerruben, kimchi etc. Bonny clabber, also known as clabbered raw milk. Some fermented foods require a starter culture to either ensure that they’re safe to eat and drink, to ensure consistent results with regard to flavor and texture or both. Sourdough bread depends upon a starter culture, which you can make through wild fermentation or, much more successfully, by using the existing starter of another baker. Kombucha and Jun tea need a mother culture to brew properly. Water kefir depends on water kefir grains. Yogurt depends up on a starter culture and kefir depends upon kefir grains. Most homemade sodas, like homemade rootbeer or probiotic lemonade, depend on a starter culture. Sweetened black tea, the substrate used to make kombucha, if left in a jar on the countertop may mold and is not likely to turn sour on its own; however, when a kombucha mother is added to that sweet tea, the bacterial and yeast strains present in the mother will gobble up the sugar, turning it into various acids and making it pleasantly tart while also giving it a boost of B vitamins. Similarly, if raw milk is left on the countertop on its own, it will sour and then clabber producing bonny clabber, a wild-fermented dairy product, but its flavor and texture may be inconsistent from batch to batch. Instead, by using a yogurt starter culture, you can produce the same consistent results from batch to batch whether that’s viscous and ropy as in a good viili yogurt or the sweet-tart flavor you fine in a Bulgarian-style yogurt. Some fermented foods can be successfully fermented through wild fermentation, in absence of a starter culture, but benefit from having one added to the mix anyway. These are typically fermented foods that are only fermented for a short duration, such as condiments or high-sugar fruits. When you’re fermenting for a short period of time, the addition of a starter culture helps to kickstart the process and produce reliable results. For homemade fermented condiments, like ketchup or mustard, they tend to achieve maximum flavor after only a few days of fermentation; further, as they are pastes, it is difficult to keep them submerged in brine and therefore it leaves them exposed to oxygen, and prone to contamination by mold. By inoculating them with a starter culture, you can shorten the fermentation time and, in doing so, reduce the likelihood of mold contamination (using proper equipment also helps). High-sugar fruits, with extended fermentation, are prone to turning alcoholic. If that’s not what you’re looking for, and are, instead hoping to create a light sauce, condiment, chutney or relish, shortening the fermentation time by using a starter culture can help you to achieve a result that’s lively and rich in beneficial bacteria, but not alcoholic. A recipe worth trying are these fermented mixed berries. Some fermented foods are traditionally prepared using a starter culture, such as beet kvass, but don’t necessarily require one. In these cases, I tend to keep with tradition and use a starter culture. Condiments and pastes which are difficult to keep submerged under brine. Owing to the popularity of Nourishing Traditions and its recommendation of whey in all fermented food recipes, newcomers to traditional foods tend to favor using whey drawn off from making homemade yogurt or from clabbering raw milk as their starter of choice; often this is a good idea as whey is inexpensive and abundant if you make your own yogurt or if you have access to raw milk. But just about any liquid that is rich in beneficial bacteria can be used, as can a packaged starter culture. For those people who are looking to use probiotic foods therapeutically and have a particular interest in consuming a specific strain of bacteria, choosing a starter culture with those strains may be of benefit. Wild Fermentation and the Art of Fermentation are excellent books about traditional methods of fermenting foods and are worth having on your shelf. Remember, fermented vegetables do not need a starter culture, but you will see better results when you use the right equipment: a fermentation crock or a jar fitted with an airlock like this. For those foods, that do need starters, you can buy starters online from reputable sources. You can buy kombucha and jun mothers, as well as fresh water kefir and milk kefir grains here. You can buy yogurt cultures and sourdough starter cultures here. A packaged commercial starter is a good choice for those foods that benefit from a starter culture.